Vincent Monnikendam's 1995 documentary Moeder Dao, de schildpadgelijkende (Mother Dao, The Turtlelike) is an unexpectedly lyrical and panoramic compilation of early 20th-century footage of Indonesia (at that time, it was a Dutch colony). Although the material is from Dutch films that trumpet industrialization and development, the viewer perceives only exploitation of resources and slavery-like working conditions. 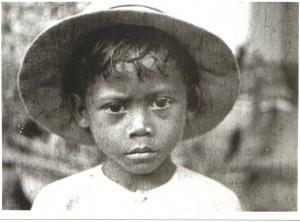 The film's structure and themes make the point that there were no positive aspects of colonialism for the people in Indonesia. 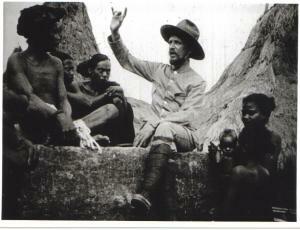 A missionary, for example, participates in the system of colonial rule (top still). Monnikendam's soundtrack uses textures of found audio and Indonesian ballads to comment on the images; the film has no interviews. The Harlem Globetrotters: The Team That Changed the World (2005) is a blue-sky promotional documentary about the glory days (shown in fleeting archival clips) of the Globetrotters basketball team. Indeed, the group's current owner, Mannie Jackson, repeatedly weighs in on their cultural and historical significance. The film's talking-heads interviews range from former team members to "Honorary Globetrotter" Henry Kissinger. Barack Obama, at the time a Senator, adds to the mix of celebrities who recall the Globetrotter magic. In Ici et Ailleurs (Here and Elsewhere, 1976), Jean-Luc Godard uses documentary-style footage shot in Israel in 1970, deconstructed and edited into a rambling critical analysis of then-current events. The film is rhetorical without story, consisting of voice-over narration and texts matched to repeated sets of images. The film sets up a visual contrast between Palestinian fighters (third still; we're told that the people shown in the footage are now dead) and a French family shown passively glued to the TV (fourth still). Godard includes cinematic flourishes, such as filming people holding photographs and TV screens (bottom two stills). Although Godard is sympathetic to the Palestinians, the film seems to treat them as symbols rather than people. Hotel Terminus: The Life and Times of Klaus Barbie (1988), by Marcel Ophüls, is four-and-a-half hours long, delving deep into Barbie's Nazi activities during and after the Second World War, namely, torture, murder, and avoiding justice. Ophüls (top still) is mordant, skeptical, and occasionally aggressive in his interviews with dozens of people, many of whom come across as liars and apologists (second still: a former SS officer). Barbie's various enablers disclose, with the filmmaker's prodding, how Barbie was useful to US Intelligence and South American dictators after 1945; his supposed anti-Communism was a handy excuse for decades until Bolivia extradited Barbie to France. Barbie's 1987 trial in Lyon gives the film a focal point and adds heft to Ophüls's accumulation of evidence and commentary. The camerawork and occasional choral music add a touch of wit throughout the film. Many of the interviews, for example, are framed with cheery (or creepy) Christmas decorations (second and third stills). Ophüls also uses some unconventional set-ups for visual variety, such as placing an interviewee in profile between the camera and the interviewer (fourth still).